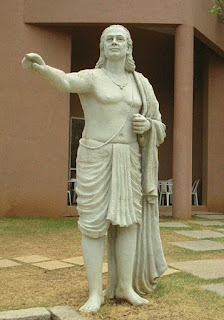 Aryabhata (Sanskrit: आर्यभट) or Aryabhata I (476–550 CE) was the first of the major mathematician-astronomers from the classical age of Indian mathematics and Indian astronomy. His works include the Āryabhaṭīya (499 CE, when he was 23 years old) and the Arya-siddhanta. Aryabhata’s major work, Aryabhatiya, a compendium of mathematics and astronomy, was extensively referred to in the Indian mathematical literature, and has survived to modern times. The Aryabhatiya covers arithmetic, algebra, and trigonometry. Aryabhata is credited to have set up an observatory at the Sun temple in Taregana, Bihar. Some sources suggest that Kerala was Aryabhata's main place of life and activity but others refute this statement. He served as the head of an institution (kulapa) at Kusumapura and might have also been the head of the Nalanda university. Some scholars claim that the Arabic text ‘Al ntf’ or ‘Al-nanf’ is a translation of one of his works. His most famous text, ‘Aryabhatiya’, consists of 108 verses and 13 introductory verses. Aryabhata did not use the Brahmi numerals; he used letters of the alphabet to denote numbers. It is probable that he might have come to the conclusion that 'pi' is irrational. He discussed the concept of ‘sine’ in his work by the name of “ardha-jya”, which literally means "half-chord". Calendric calculations devised by Aryabhata are used for fixing the ‘Panchangam’ (the Hindu Calendar). He correctly stated that the earth rotates about its axis daily. The place-value system, first seen in the 3rd-century Bakhshali Manuscript, was clearly in place in his work. While he did not use a symbol for zero, the French mathematician Georges Ifrah argues that knowledge of zero was implicit in Aryabhata's place-value system as a place holder for the powers of ten with null coefficients. caturadhikam śatamaṣṭaguṇam dvāṣaṣṭistathā sahasrāṇāmayutadvayaviṣkambhasyāsanno vṛttapariṇāhaḥ. "Add four to 100, multiply by eight, and then add 62,000. By this rule the circumference of a circle with a diameter of 20,000 can be approached. This implies that the ratio of the circumference to the diameter is ((4 + 100) × 8 + 62000)/20000 = 62832/20000 = 3.1416, which is accurate to five significant figures. that translates to: "for a triangle, the result of a perpendicular with the half-side is the area. Aryabhata discussed the concept of sine in his work by the name of ardha-jya, which literally means "half-chord". For simplicity, people started calling it jya. When Arabic writers translated his works from Sanskrit into Arabic, they referred it as jiba. However, in Arabic writings, vowels are omitted, and it was abbreviated as jb. Later writers substituted it with jaib, meaning "pocket" or "fold (in a garment)". (In Arabic, jiba is a meaningless word.) Later in the 12th century, when Gherardo of Cremona translated these writings from Arabic into Latin, he replaced the Arabic jaib with its Latin counterpart, sinus, which means "cove" or "bay"; thence comes the English word sine. That is, find N = 8x+5 = 9y+4 = 7z+1. It turns out that the smallest value for N is 85. In general, diophantine equations, such as this, can be notoriously difficult. They were discussed extensively in ancient Vedic text Sulba Sutras, whose more ancient parts might date to 800 BCE. Aryabhata's method of solving such problems, elaborated by Bhaskara in 621 CE, is called the kuṭṭaka (कुट्टक) method. Kuṭṭaka means "pulverizing" or "breaking into small pieces", and the method involves a recursive algorithm for writing the original factors in smaller numbers. This algorithm became the standard method for solving first-order diophantine equations in Indian mathematics, and initially the whole subject of algebra was called kuṭṭaka-gaṇita or simply kuṭṭaka.